Since artists have to do things different ways so we don't get stale, this painting was first drawn with pen and ink. Then I did washes of color. It creates an interesting texture. Usually on painted porcelain, smooth is the plan so this was a fun change. 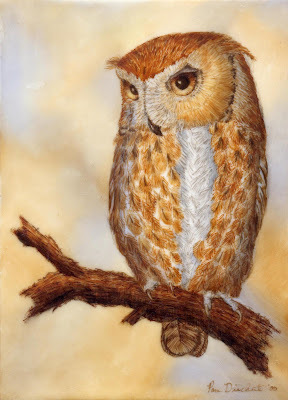 This little owl tile now lives in the Netherlands.